Coonan pistols in particular are very accurate, have good triggers and tame the .357 recoil well — especially when compensated. Absence of barrel to cylinder gap means no pressure loss, so muzzle velocity of 1400fps with 158gr and 1600fps with 125gr ammunition is typical. Bonded 158gr at 1400fps means not having to choose between expansion and penetration. This entry was posted in ammunition, pistol and tagged 357Mag. Bookmark the permalink. You may well see something like that in the near future. 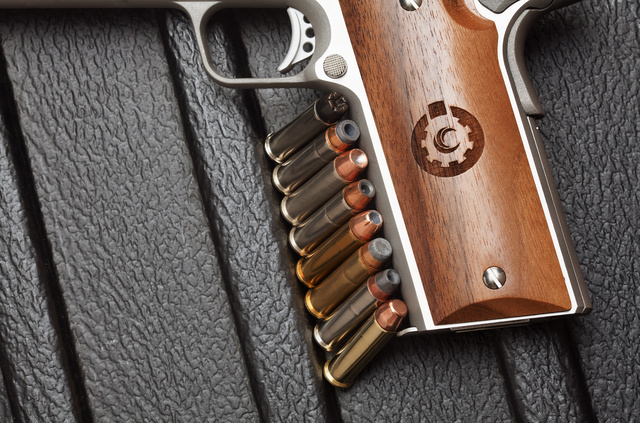 A gas-operated .357Mag would have nearly no recoil, a good thump on target in a wide bullet weight range. With magazines that interchanged with the pistols. A pistol design can legally become a rifle design, can’t it? Wow would love to have both a pistol and carbine! 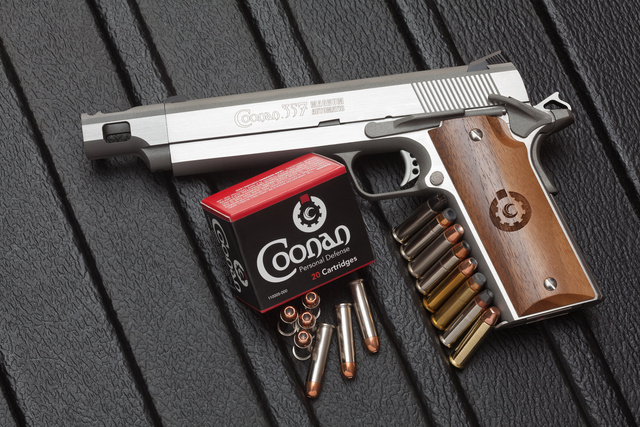 A Coonan .357 pistol has long been on my want list. Carbine companion for my S&W Model 19 would probably be higher. Unless it’s a bullpup. Have never understood the fascination with that, and the few I’ve tried (AUG and a .50 BMG single shot) have all been at best “meh” for me. One great thing about a consumer culture, it’s not usually a zero sum game for you to get what you want and I to get what I want. Weston – Coonan solved the problem? Better tell that to my early-model Desert Eagle in .357 Magnum. Bigger, but a contemporary gun to the Coonan, circa 1983. Granted, they’re totally different handguns, intended for totally different purposes, but the Desert Eagle is also a longtime autoloader chambered in rimmed ammunition, and it’s not the first, either. Desert Eagles also came in .41 Magnum and .44 Magnum – both rimmed rounds originally intended for revolvers. As far as solving the rimmed ammo problem in a historical context, I also have a Smith & Wesson Model 52, which is a 1961-vintage target autoloader chambered in .38 S&W Special (a rimmed cartridge). Many Colt 1911s were also chambered for .38 S&W Special during that timeframe, to compete in Bullseye Matches opposite the S&W Model 52 and target revolvers so chambered. Having tried to get Coonan magazines for a Model B some time ago, I’m not entirely sold on the brand. At least it wasn’t a Model A. Then there was AutoMag. Proprietary ammo and all. choice of .357 (based on a .223 Remington case IIRC) and .44 Magnum (based on a .308 Winchester case IIRC). Both gave you the option to bring down whatever you could hit, with an autoloading pistol. Todays best bet would be the 10mm pistols, which, in 5″ barrel versions, have heavier termal ballistics than .357 Magnum. If you took your fave 10mm and had a 6.5″ ported barrel built for it, you would have that sidearm artillery that you want. As to carbines, Ruger still builds the .44 Magnum Deerfield. Get with your local machine shop and turn some of their 4-round rotary magazines into hi-caps, and you’re set with a hot-shooting little carbine. Of course, you can buy an upper receiver for the AR-15 that will chamber whatever you want, and the modular lowers mean that you can build adapters for anyone’s magazines, too.